Cruise Books, Army Yearbooks, Marine Yearbooks, Air Force Yearbooks, and Navy Yearbooks. Service and loyalty to country are what binds all branches of the military. Entering the service is a monumental decision in an individual’s life, one that impacts family and friends as well. The bonds and experiences of our men and women of service—from training to active duty—are more than just mere events in their life. They are memories worthy of preservation. At Speedway Yearbooks, we’re devoted to recording this legacy in customizable Military Yearbooks for all branches of the military, including the Army, Navy, Marines, and Air Force personnel. It is an excellent way to document the camaraderie experienced by the men and women of our military. 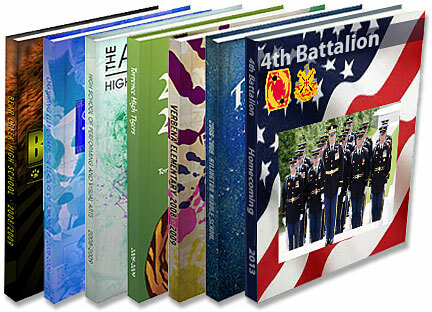 Speedway Military Yearbooks, Military Memory Books, and Military Cruise Books are also ideal for the Military Homecoming Ball and other events that honor our active duty military men, women and veterans. Speedway Yearbooks understands the significance that these moments hold for our military heroes, their families, and friends. That’s why we strive to produce quality Military Yearbooks, Memory Books, and Cruise Books at an affordable price and in a timely manner, so our men and women of service can take home a memento of their military experience—fast. First, our Free Yearbook Software, SuruDesigner, provides you with a platform for quickly designing and completing your Yearbook. Second, all of our Yearbooks come in full color, so your photos are vividly preserved—at no extra cost! Third, we ensure that your yearbook is bound using library quality binding standards for uncompromising quality and durability.Fourth, our cutting edge production technology allows us to offer our services to you at a lower cost with an uncommonly fast turnaround speed, so that no time is wasted getting your yearbooks back to you. Finally, you can distribute and sell your Yearbook through our website. If you’ve already put in the work to create your Yearbook with our software or some other software, you don’t have to go through the hassle of gathering funds to order dozens or hundreds of copies. You can order just your individual copy. You can then send the order link for your Yearbook to everyone who is interested. They can then order their copy directly from us. Yes, we’ll take care of the shipping. Want to add a markup to the cost of your Yearbook as a fundraiser? No problem. Your Yearbook is listed for the price you want, and we transfer the difference to you once a month.